Being a grill-master takes a certain level of skill and requires the right tools to take your cooking to the next level. Sauces, braises and marinades are one thing, but does anyone on your block know how to effectively smoke those pork chops on a gas grill? Fill the bottom of the Stainless Steel Smoker Box ($40) with your choice of wood chips or herbs and your meat, resting on top of a perforated tray, will be cooked to perfection with complex, smokey flavors. 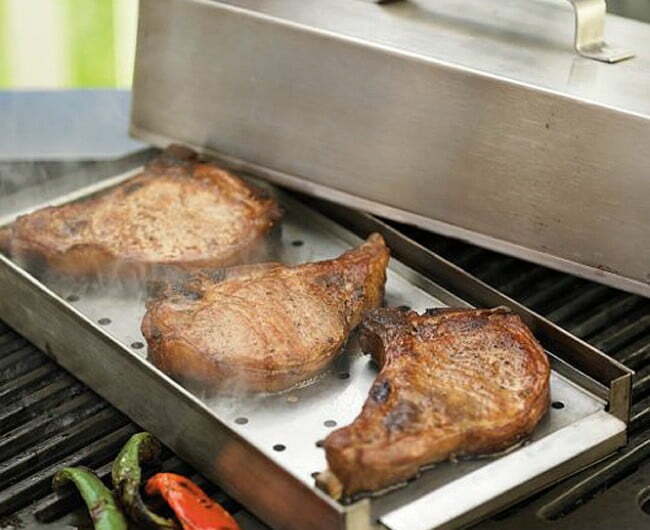 The box can rest on your grill with the lid on while you cook other food, or it can turn your whole grill into a closed smoker if the lid is left off of the smoker box. Not a bad way to up the ante on your warm-weather grilling, or impress the neighbors with your expert skills and delicious eats.